A research program on rapid reviews: where should we venture next? 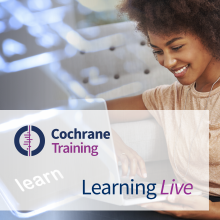 In these videos, originally part of the Cochrane Learning Live webinar series, Dr Andrea Tricco highlights the differences between rapid reviews and systematic reviews. Dr Tricco describes a research program on rapid reviews and outlines practical recommendations on doing rapid reviews, focusing on the Guide to Rapid Reviews, which was published by the Alliance, World Health Organization. The webinar was organized by the Cochrane Statistical Methods Group, with support from Cochrane's Membership, Learning and Support Services. The webinar was delivered in August 2018. Below you will find videos from the webinar along with the accompanying slides to download [PDF]. Dr Andrea C. Tricco (PhD, MSc) from the Li Ka Shing Knowledge Institute of St. Michael’s Hospital, Toronto, Canada, holds a Tier 2 Canada Research Chair in Knowledge Synthesis. Her research interests are related to responding to knowledge users (including patients, healthcare providers, and policy-makers) through knowledge synthesis. Her research also focuses on advancing the science of knowledge synthesis and she is leading research projects related to rapid reviews, network meta-analysis, and scoping reviews.